The temperature has finally dropped here this week, which means that I'm out of excuses for avoiding more Race For Life training. Did I mention that I'm not a keen runner?! Or exerciser (is that even a word?!) in general, if I'm being honest. You can read more about that here. 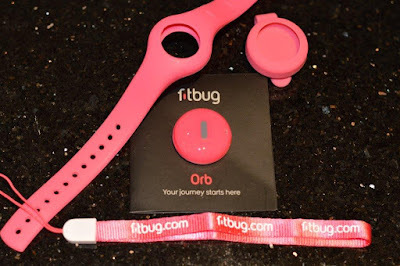 Luckily though, I've had the chance to try out a bit of motivating kit recently - the Fitbug Orb. This is a 'wearable tracking device' - so basically that means you wear it (does what it says on the tin, love it! ), and you can track your fitness, activity and sleep. To do this I downloaded the app to my mobile phone, but you can also download the info to your computer if you wish. Included in the box are a watch-like wristband, a belt clip and a short lanyard, so you can decide what suits you best. I quite liked the funky watch look, but also found you could hide the Orb quite neatly under clothes by using the belt clip. The Orb is smooth and round, and slips easily into the wristband or belt clip holder. There's just one button to press on it and this controls the mode according to how many times you press it. You can also download info immediately to your app or desktop by pressing this button. The number of steps you take is recorded, whether they are everyday standard steps or aerobic running steps. To record sleep you change the mode easily, and then the length and quality of your sleep is recorded. You can also track what you eat and calorie count, although I'll have to be honest and admit I haven't found time in my crazy life for this yet. There's so much more to it than this though, and I think if you are looking for a great value, quick and easy activity tracker, this could be the one for you. The Orb is powered by a small battery which last for around 4 months (replacements are quite cheap) and it retails for around £49.95. It comes in white or black versions too so you don't need to be overtly girlie! Please do check suitability for your phone or device - most are covered but it always pays to be sure.